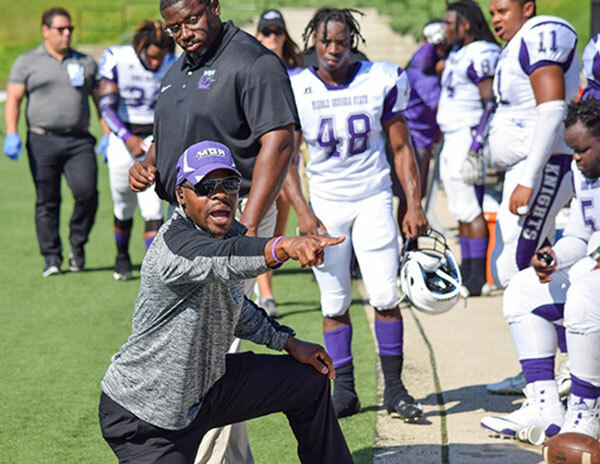 Former NFL player Kiwaukee Thomas, who grew up in Warner Robins and graduated from Ashford University, has ushered in a greater level of professionalism and competitiveness for MGA's football club team. He played college football at Georgia Southern and was drafted by the Jacksonville Jaguars. Title: Head Football Coach of the MGA National Club Football Association Knights. Degree: Bachelor of Arts in Sports and Recreation Management from Ashford University in Clinton, Iowa. “Last fall, I was brought to the university to transform the MGA Knights into a perennial championship football program and immediately began to focus on raising the standard of competition and functioning as a true football program, one whose vision is to unite our university, inspire our student-athletes, and increase community involvement. I came to MGA with the mission to give student-athletes that did not receive a full scholarship, an affordable option to play competitive football for a high-caliber football program. Rebranding our football program and contributing to the growth of the MGA student population has been two of our major accomplishments. Student-athletes want to come to MGA to play football. During our first recruitment season, we had visits from over 175 football prospects and their families on our Cochran campus. We hosted two summer camps that each had over 100 participants on our Macon campus. The football team has expanded. Last year, there were 40 student-athletes that began training camp. This year, we began training camp with approximately 114 of which 14 were returners from the previous season. This increase in size allowed us to have both a traveling and a non-traveling football squad. What attracted you to a position at Middle Georgia State University? What do you like best about working at Middle Georgia State University?